Who Are You and Where is My Husband? One little known fact about North Devon is that in some hidden valleys there are still bears. These bears can’t be seen during the day but at night they come out and behave in strange, almost human ways. For example, when Mr B2 and I were at the National Trust Peppercombe Bothy a wee while ago, I was woken up by some very strange snuffling sounds. I took no notice because I had already checked for signs of mice and put all of the consumables into a tightly lidded box. 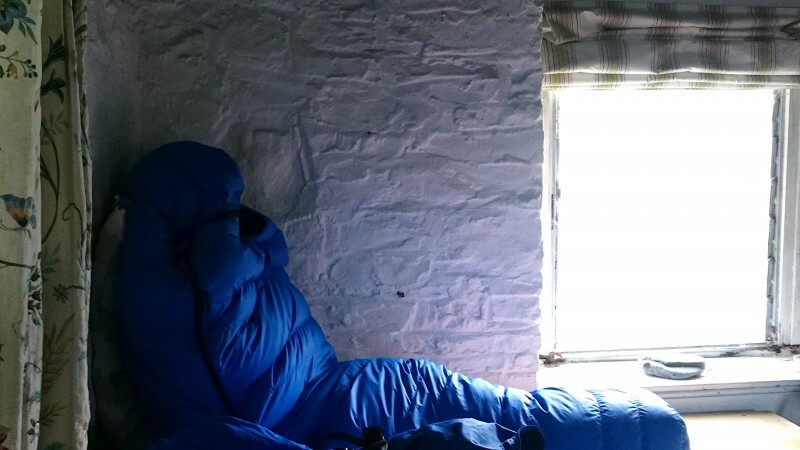 Shortly after (or it could have been hours, bothies are very dark) the bothy door opened and then shut again. At birdies (dawn) I started to stir properly… that is until I was frozen in fear by an abominable grunting noise; the noise rose and fell in growling tones, it was definitely a bear but I had no idea how he had got into the bothy and I wasn’t going to stick my head out of my sleeping bag to find out. Maybe the bear had eaten Mr B2 in the night and sneaked in through a poorly latched door. Perhaps the back window did open after all. Anyway I was surprisingly unperturbed by the possible bear-presence and I dozed off again with these thoughts (and the rhythmical bear noise) rumbling through my head. About an hour later the noise had stopped, I looked over to the other sleeping platform to reassure myself that Mr B2 hadn’t been eaten by a bear. It was difficult to tell, there was a blue lump sitting there that could have either been a grizzly or Mr B2. I wasn’t really sure which until the blue lump got up and made me a cup of tea! Circa 1978 I was, believe it or not, an enthusiastic Round Tabler up in Teesside. We had an annual inter-table competition in the form of sketches on the stage. We did a very lewd version of Magic Roundabout and I was Brian the Snail wrapped up in a blue sleeping bag almost exactly like your photo, so perhaps it was a giant snail you heard? Green sleeping bags always make people look like caterpillars! I suspect you were visited by a couple of courting hedgehogs – but of course, it might have been the greater male Blue-snorter Bird ? Well there was definitely snorting going on! That is a Tarbuck Knot. It was used in climbing and invented by Ken Tarbuck who was a member of the Wayfarers’ Club of which I am also a member. It related to now outdated nylon rope and is regarded as unsafe. It does slip to a certain extent which supposedly lightens the otherwise sudden strain on the rope in the case of a fall.